Honor the past, celebrate the future. "A place of history, founded on true aloha. Coco Palms is a place with a bright future"
As of today, the next chapter of Coco Palms is on track for an exciting future. From the original 24 hospitality rooms that were available in 1953, to the growth and limelight the resort received from the movie "Blue Hawaii", to the experiences that so many remember, Coco Palms is officially closer to re-opening than ever before since closing its doors. Watch the video below to see some of the construction process so far. So far the grounds have been cleared, pathways re-claimed from overgrowth, rooms cleared out, by the fast working construction team. With a clear vision on Coco Palms future and a great respect to its honored past, Coco Palms is quickly moving to the remembered greatness it once held as a place of experience and aloha. At this time all buildings in Coco Palms except the last remaining Shell Building are completed and ready for vertical construction. 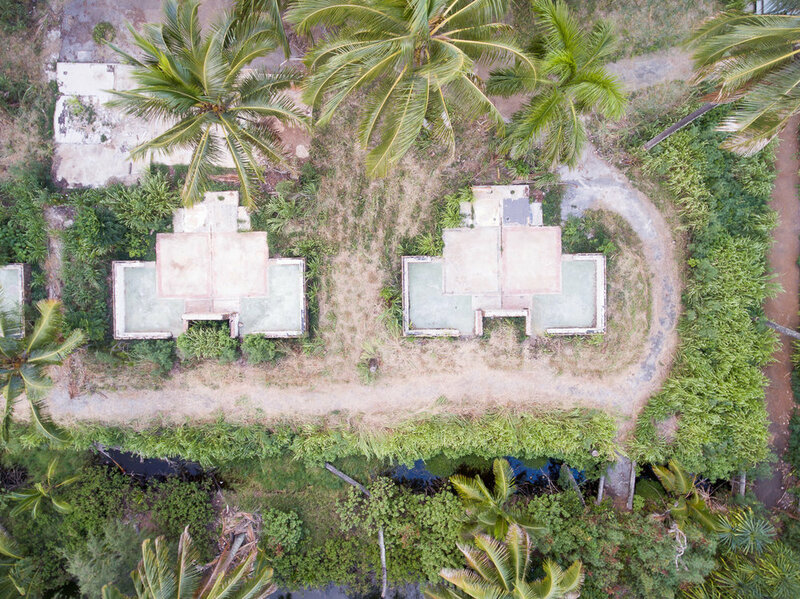 What makes the next stage of renovation so exciting and fast paced is that Coco Palms main structures have stood the test of time, with only surface damage to its rooms interiors and walls. What this means is a fast paced renovation process as Coco Palms as the rooms are rebuilt, new infrastructure created, kitchens being re-built, and a beautiful rendition to the legendary Coco Palms lobby, all on the same and original footprint of Coco Palms. With the help of many, from people like Bob Jasper who ran Coco Palms tours and over saw its safe keeping for so many years, to legendary Coco Palms musician Larry Rivera serenading couples with his music as well as ordaining weddings, to the support of so many past guests, the story of Coco Palms has stayed true and alive. There has been many, many questions of Coco Palms future, especially upon the start of the renovation process 6 months ago. Ranging from how many rooms, will Coco Palms have the same spirit, to is it finally happening? Coco Palms is in fact well on its way to its bright future. Not only for previous and future guests upon re-opening, but also for the community of Kauai. From the opening of new restaurants on property and the re-opening of the beach side Shell Restaurant on Wailua beach, to historic and culturally reflective sites on property to learn about Hawaii's culture, its history, and Coco Palms history within in that, Coco Palms is well on the way to its doors opening again. 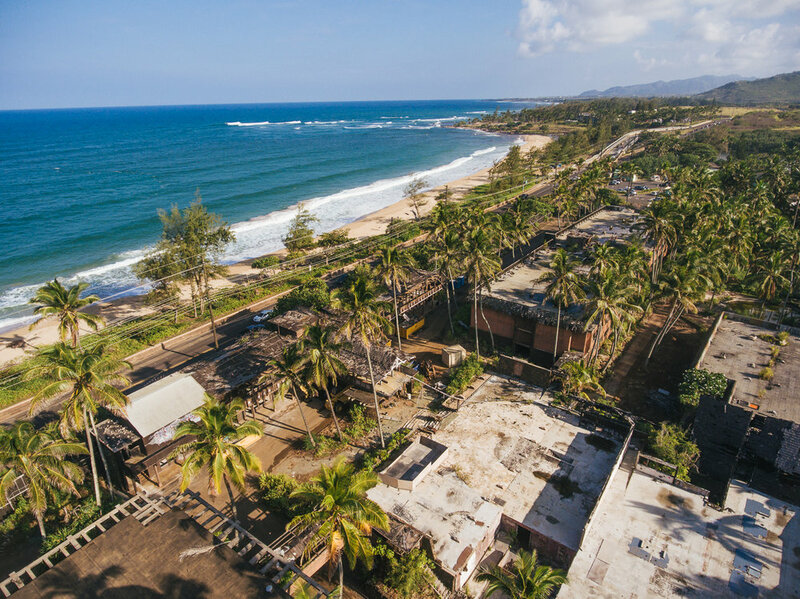 We look forward to the completion of this stage of construction and the upcoming start of vertical restoration and construction for Coco Palms and the continued support from its ohana. You can stay tuned by following here on the Coco Palms news outlet, on social media like Facebook and Instagram, or by signing up for the Coco Palms newsletter. 1. Lighting is everything. Do not book a shoot mid-day, because the lighting is directly above and can often be harsh. 2. Color is key. Making sure there are contrasting colors to make the white wedding gown pop, or to make sure the black tux doesn't get lost is important. 3. Location, location, location. Whether you're shooting on the beach or in the Coconut Grove of Coco Palms Resort, the location helps to tell a story. Selecting what kind of image you want to portray is important when capturing this memory. 4. Love lives. Being in the moment with your significant other is important. Sometimes you have to forget there is a camera, and get lost in each other. 5. Golden rule. One tip many videographers forget about is that exterior noise can affect your wedding video. Requesting that guests turn off their phones or electronics (ipads, etc.) can control exterior noise caught on tape during a ceremony or speech. Join us on a visual journey of the new Coco Palms Resort on the island of Kauai. Slated to open summer of 2018 as part of the Unbound Collection of Hyatt Hotels. Coco Palms by Hyatt will offer approximately 280 standard hotel rooms and 70 junior and master suites. The iconic property which sits on 46 acres will also offer a cultural center, Hawaii's largest protected coconut grove and agricultural land. Whether it's ALOHA FRIDAY, or you just want to bring a little bit of Hawaii into your home... Try this DIY recipe on a Blue Hawaii cocktail. The extensive coconut grove is a place of serenity and is often described as sacred. During the renovation of the Coco Palms Resort, the construction team has taken extra caution in preserving and maintaining the legendary trees. In addition to the commitment for a sustainable and low impact hotel, the Coco Palms Resort will also provide the community with an on-site Cultural Center. Hotel guests and community members will be encouraged to participate in cultural activities such as coconut weaving, hula, and talk story sessions. Want to support our efforts in building the cultural center? Click here. Coco Palms Kauai is a legendary & historical resort, with its progress and direction to re opening its doors in late 2018 for guests to visit once again. Join us for the journey, honoring the past while celebrating Coco Palms bright future.